With summer in full swing and families heading out to go blueberry and even peach picking, now is the perfect time to pick up your copy of the new 37th edition of the Ball Blue Book canning recipe book, to help you with all your canning needs. I have been busy canning blueberry jams from blueberries the girls and I have picked during the week, to surprise family and friends with, as well as enjoy at breakfast on toast. Yum! "Jarden Home Brands will host this year’s fifth annual Can-It-Forward Day, broadcast live online at FreshPreserving.com from 11AM – 4PM EST TODAY from the new state-of-the-art Jarden Home Brands headquarters in Fishers, Indiana. An event celebrating the joys of fresh preserving, Can-It-Forward Day encourages gardeners & food enthusiasts across the country to celebrate what “Made From Here” means to them by fresh preserving their favorite local ingredients in peak season. The webcast will have an integrated chat function where viewers can submit their home canning questions to be answered in real time. New this year, there will also be an exciting celebrity mason jar auction unveiled during the webcast! Special feature: Rebecca Sullivan - preserving in Australia! Share what you make with #canitforward and #madefromhere on any social network.Click here to download recipes from the Ball Canning Ambassadors! I was smart when it came to picking as I brought along an extra container that I filled, which sole purpose was to satisfy our strawberry cravings for the drive home. By the time we got home, the container was empty, and the girls had red lips and fingers and smiles on their faces. :-) After cleaning and prepping the strawberries for snacking, freezing and canning, I pulled out the new 37th edition of the Ball Blue Book canning recipe book. "The most trusted resource in home canning for over 100 years, the 2015 release of the Ball Blue Book is its largest update since the first edition in 1909." The new 37th edition, which hit book shelves earlier this month, is a must have for canners, both novice and expert. With over 200 pages, this canning cookbooks has expanded 56% from the previous edition, and includes 75 new recipes, pictorial step by step canning guides for beginners, and a special special section for Meal Creations and recommendations with tips for creating your own signature food. Can you belive that the (AKA the Canning Bible for canners) was first published back in 1909? For over 100 years, the Ball Blue Book has become the most trusted resource for home canning. I remember when my grandmother and great aunts were going through their cookbooks when downsizing, they gave me their editions they had collected and used. This was my first experience with canning and from that point on I was hooked, and love to make jams, pickles, salsas, etc. with fresh fruits and vegetables I grow in my own garden or pick at local farms with my family. There is just something about being able to can fruits and vegetables to enjoy throughout the year, as well as share as gifts everyone loves to receive, that puts a smile on my face. And, whenever I find myself looking at freshly picked berries like the amazing strawberries the girls and I picked the other day, I am quick to grab my latest edition of the Ball Blue Book Guide to Preserving for family favorite recipes and new recipes to try. Here is a quick and easy strawberry jam recipe that is posted on the Jarden Home Brands' Fresh Preserving website, which is filled with tons of canning recipes you will find in this and past Ball Blue Book editions. Tip #1: Safety is just as important as taste. A recipe needs more than good flavor to be considered safe for home canning, that's why it's absolutely imperative to choose recipes that are tested and approved in accordance with USDA guidelines. Rest assured that all recipes in the Ball Blue Book have gone through vigorous testing and are deemed safe for home canning. Process and recipe validation is always the highest priority to ensure the best results consistently for consumers. Tip #2: Fresh preserving is just three steps. If you can boil water, you can can! Simply prep your equipment, prepare your tested and approved recipe, and follow the proper corresponding preserving instructions to ensure the perfect batch every time. We know with 100% confidence that when these three steps are done properly, home canning is undoubtedly safe and very rewarding. Tip #3: Size matters. Fresh preserving is equal parts art and science. Each recipe is tailored for a specific Ball canning jar size, so it's important to use the jar indicated in the recipe. Experts at Jarden Home Brands have tested all Ball Blue Book recipes to determine the most appropriate jar size, which is listed alongside each recipe. You can also reference this helpful jar selector guide on FreshPreserving.com if you're unsure. Tip #4: Jam isn't just for toast. Fruit spreads are some of the most versatile preserved foods and can be used for so much more than topping scones or toast! The newly-added Meal Creations guide in the Ball Blue Book showcases how to transform a jar of delicious Apricot Preserves into recipes like chicken glaze, or Strawberry-Kiwi Jam into salad dressing! Tip #5: Tomatoes are a top pick. Out of all fruits and vegetables, tomatoes are the most popular ingredient to preserve because they're so simple to prepare—and delicious. Tomatoes Packed in Juice is an easy way to begin preserving the season's best tomatoes from your farmers market, home garden, CSA or local grocery store. 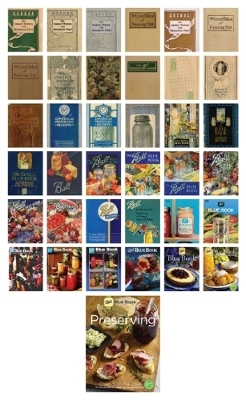 The 37th Edition of the Ball Blue Book® Guide to Preserving is available to purchase now at www.FreshPreservingStore.com and can be found at select grocery, hardware and mass retailers nationwide, as well as online. For more information on all Ball brand canning products and safe home canning practices, visit www.FreshPreserving.com or the brand's social media channels including Facebook (www.Facebook.com/BallCanning), Twitter (www.Twitter.com/BallCanning) and Pinterest (www.Pinterest.com/BallCanning)." Thanks to the kind folks at Jarden Home Brands, in addition to new canning products and cookbook sent to me for review, they also included a FREE coupon for a case of Ball Brand canning jars for me to offer as a reader giveaway. You never can have enough canning jars, right? Want to win this FREE coupon for a case of canning jars? Then, complete the entries on the Rafflecopter form below. Good luck!